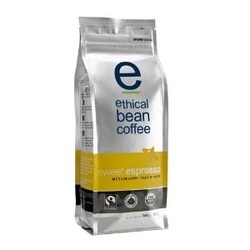 Save on Ethical Bean Sweet Espresso Med Drk Rst Coffee (6x12 OZ). A multi-dimensional, full-bodied velvet slipper for your tongue, dripping with crema. A stand-up straight shot. Marries beautifully with milk. This decriptions is informational only. Please review the actual product for ingredients and suggested serving prior to use.